Decca 473 659-2. The Zoo isn't mentioned on the cover, but it's there all the same. For many years, the score was believed lost until noted Sullivan sleuth Terence Rees found it in a vault at Coutts bank. Rees was eventually able to buy the score at auction, and with his cooperation a piano reduction was published. 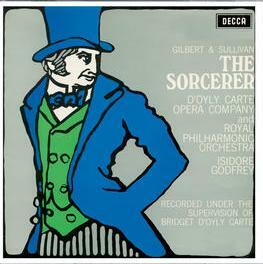 The work received its first modern production in 1971, but it did not become popular until after the appearance of this recording, in 1978. The Zoo does not have the sustained excellence of any G&S work, but at half-an-hour's length, it doesn't need to. It is certainly a worthy curtain-raiser to any of the shorter G&S operas, and it can also stand on its own in a shorter program. Unfortunately, the recorded performance only calls forth what Nanki-Poo describes as "modified rapture." For the most part the singers are pretty lifeless. Maybe this is due to British restraint or maybe it comes from the fact that this is a studio performance by performers who have not had the chance to really get into their parts, as they would have done if they had performed them onstage. The soloists and chorus sing well and accurately, but often they sound too carefully polished. There is also an intrusive, irritating and unnecessary narration. 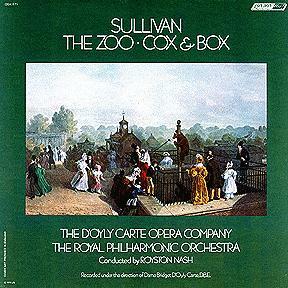 While the recording does not do an ideal job of conveying the opera's virtues (such as they are), The Zoo is nevertheless worthy of consideration by any G&S troupe that is ready to move beyond "the big thirteen."